Most people come to us knowing they want to lose weight and feel physically better… and on day one discover meditation and yoga and the radically non-judgemental attitude of the retreat and start waking up to kindness and to ‘coming home’ to the body. 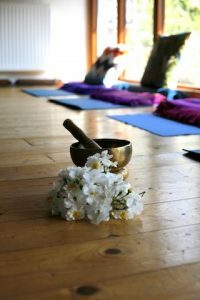 On retreat Sho leads the meditation class bringing you into a space of relaxation, connection, concentration and kindness. This is a practice of remembering who we truly are and developing a conscious way of being with ourselves and in the world. Sho lived in India for 4 years studying and practicing yoga and meditation. Sit still for one minute. Close your eyes and calmly listen to your breath, allowing thoughts to appear and depart freely. Keep returning to your breath. Breathing in for a count of 3 and out for a count of 5. Did you find that calming, and maybe also a little difficult? You are not alone. Surprisingly, our super brain finds it almost impossible, at first, to remain fixed on our present moment without remembering past or imagining future events. This type of concentration and ‘just being’ is a skill like any other, one that can be learned with practice. With time we develop the ability to be still and present. To calmly feel and welcome the reality inside us, previously invisible to us. Take a moment. Close your eyes. Breath each breath as if this was your first and last breath. Notice the sensations throughout your body. Allow your weight to move down into the ground. Feel your connection to the earth as ‘grounding’… Strongly connected to the earth feel your body filling with light lifting energy, lengthening your whole body from the core upwards. Relax into this new open space. Listen to your breaths. Stay with yourself filling yourself with self appreciation just for being there. This self-love and acceptance has the power to heal past events and emotions by embracing them as they rise (instead of elaborating on them as they rise). You can visualise this as holding your own hand, giving yourself a hug or a pat on the back or anything! Then, let it go. Being with yourself in the present moment can yield surprising results. This moment is, after all, is the one in which everything happens.